Le Beau Monde, May 1807. This magazine frequently used three figures in a single print, often including a male figure. The gentleman here is carrying a chapeau bras, generally a bicorn (but sometimes tricorn) hat that could be folded and carried under the arm for formal occasions. Note also his watch fob and chain, the ruffled shirt, and fancy neckcloth. Note also the quizzing glass held by the woman on the right. “Fig. No. 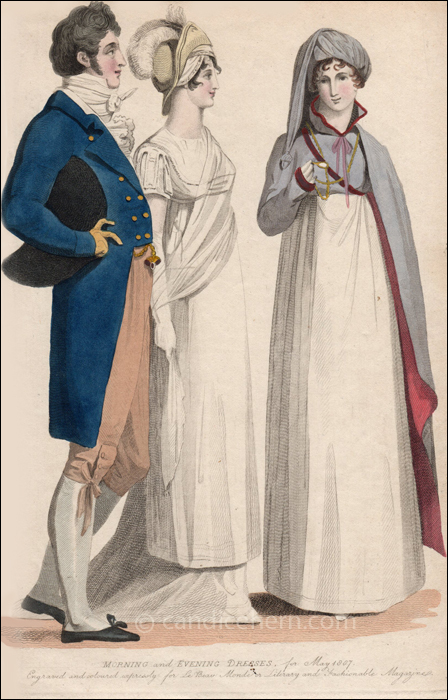 1.–Full Evening Dress for Gentlemen consists of a blue coat, lappeled, flat gilt buttons, and black velvet collar; or a dark silver or brown coat, lappeled, covered buttons, and collar of the same cloth; these three are literally the only coats that are worn at present, and have generally the two or three bottom buttons buttoned. 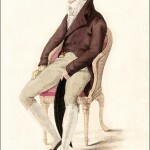 Waistcoats, of fine Marseilles quilting, and single breasted; drab kerseymere breeches, with silk strings at the knee. Snow what narrow ribbed silk stockings, with shoes in strings. “Fig. No. 2.–Lady’s Evening Full Dress is composed of a train of very rich Italian crape, lemon color, spotted in various directions with silver spangles; a train petticoat and body of soft white satin; sleeves, and body is composed entirely of rich point lace inlet with wreaths of Brussels lace, ornamented with two more narrow rows of silver to correspond with the remainder of the dress. [Up to this point, the description seems to refer to a different dress entirely than the one in the print, though the rest of description fits.] A lace shirt made close to the form of he neck, without any trimming round the throat. A loose drapery of fine cobweb muslin covers the left shoulder, passes over the bosom, and entwined round the right arm. A dress hat of white or cream-coloured chip, or straw, is made to cross the front of the forehead, turned flat up in front, trimmed with narrow wreaths of small white roses; a beautiful ostrich feather, fastened in the center to fall back over the crown. White kid gloves and shoes of lemon-coloured satin. “Fig. No. 3.–Lady’s Morning Walking Dress is composed of a white muslin gown, ornamented at the bottom with a narrow border of fancy needlework, made quite plain, with long sleeves; a mantle of lilac or dove-coloured sarsnet, made with a spencer, which confines the waist with a high standing collar, bound and tied round the throat with rose or pale pink ribband; it crosses the bosom, and confines the mantle which fastens on the back of the left should in full plaits; it is cut irregularly at the bosom, and flied open in front, lined throughout with rose or pale pink to correspind. A cap made of the same materials. Gloves and shoes of the same colour as the mantle.